Email Mia Dubosarsky for more information and to request an application form. We look forward to working with you in shaping the next generation of STEM thinkers. What does it take to create a high-quality STEM program that thrives and is embraced by all stakeholders? The STEM Education Center at WPI can assist you in answering this question and more through Strategic STEM, a program designed to provide guidance to education leaders and administrators in creating a long-term, strategic plan to implement high-quality STEM education across their schools and districts. Developed in 2011, Strategic STEM is a two-year program for education leaders who are looking to create a high-quality and sustainable STEM program for their school, district, or education system. The program includes professional development (PD) days, school visits, panel discussions, mentorship opportunities, and a culminating presentation. Imagine what integrated STEM education could look like at your school/district. 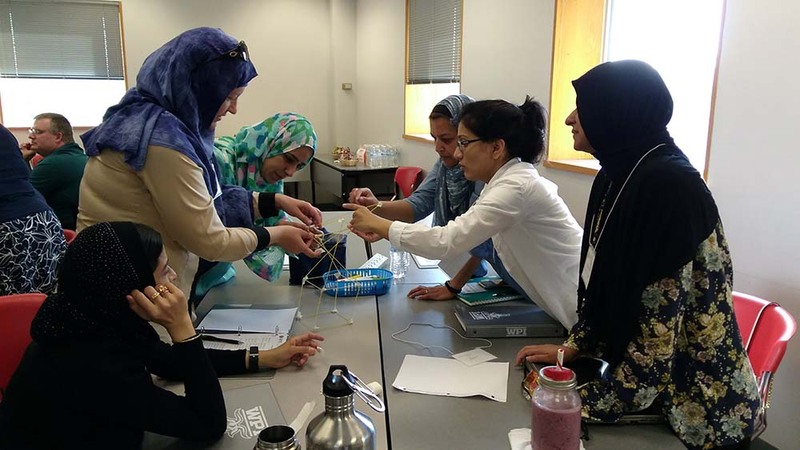 Your team will engage in visioning sessions while exploring what successful STEM schools do—based upon national programs, research, and standards—to create a STEM program that matches your community’s unique values. Guided by experienced WPI staff and mentor teams, you’ll review several successful STEM integration models, ultimately customizing the one that best fits your needs. You and your teams will research STEM frameworks, develop visions, pillars, and outcomes for your students and teachers, explore funding opportunities and implementation plans, and more—all with the final result of a complete strategic plan for STEM integration. Once you’ve created your plan, you and your team will be supported through the implementation of your top-priority items, including two STEM PD days for your teachers. If you or your company would like to support the Strategic STEM program, email Mia Dubosarsky for more information. Year Seven of Strategic STEM has three schools participating—Cushing Academy of Ashburnham, Marlborough Public Schools, and Venerini Academy of Worcester. If you’re interested in learning more and applying to be one of the schools in Year Eight, get in touch with us today. We look forward to hearing from you. The support from WPI was excellent - extremely friendly and knowledgeable staff with deep expertise in STEM as well as sensitivity to the real world demands of building a new program in a real school with real teachers and students. This program gave us a chance to focus on STEAM, something that at times is an overwhelming concept for our teachers. As STEAM is part of our district's strategic plan, this had helped us break it down in to more manageable and obtainable goals. This experience has provided the framework for our team to move forward. To this point we have had a haphazard STEM program at best. Having gone through this process has given us a road map for the future. It brought our teaching staff together from all levels in order to plan and be involved in the problem solving. It allowed us to utilize strengths from all of our teachers, not just individuals within their classrooms.